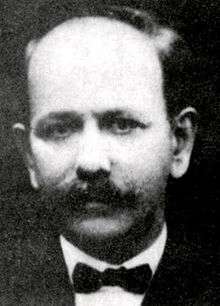 Allameh Ali Akbar Dehkhodā (Persian: علی‌اکبر دهخدا‎‎; 1879–March 9, 1956) was a prominent Iranian linguist, and author of the most extensive dictionary of the Persian language ever published. 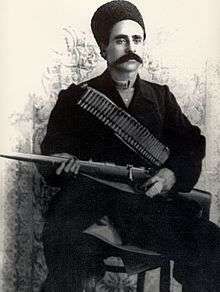 Dehkhoda was born in Tehran to parents from Qazvin. His father died when he was only 10 years old. Dehkhoda quickly excelled in Persian literature, Arabic and French and graduated from College studying political science. 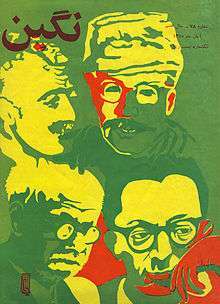 A magazine cover reproduced from an original poster by Guity Novin depicting four Iranian writers of the 20th century (Jalal Al-e-Ahmad, Samad Behrangi, Ali-Akbar Dehkhoda, and Sadeq Hedayat). ↑ "University of Tehran" (in Persian). Ut.ac.ir. Retrieved 2010-09-07. ↑ "Photograph of Dehkhoda's grave" (PDF). inlinethumb05.webshots.com.